Aquila systems moved to its current premises; Aquila House in Laygate in 1993. 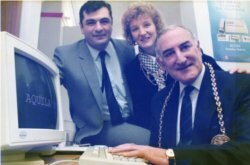 In the attendance of the Mayor and Mayoress Bamford whom inaugurated the opening of the new premises, to the welcome speech delivered by an Aquila Built computer system. Aquila is one of the initial Information Technology companies, if not the first established in South Shields, and has always been at the vanguard of technological innovation for the benefit of residents and companies based in South Shields. Being the oldest established information technology firm in South Shields carries the responsibility of keeping our pool of engineers at the highest levels of competence which translates into our postgraduate Masters levels of knowledge base, that can be drawn upon for the benefit of our clients. Our capable staff enjoying high levels of competence are not given to bamboozling the clients in order to impress them; with this no nonsense attitude of our staff, it makes sense for our clients to enter into a long term partnership with Aquila Computers.